Civilian land confiscated by the military and government departments for State projects and private companies has reached 2 million acres. The majority of confiscated lands are owned by small-holder farmers, with 90% of the victims dependent solely on their lands for their livelihoods. With such devastating effects on rural livelihoods, land conflict is the most pressing issue facing Burma today, second only to armed conflict. To date, the peace process between the Burmese government and the country’s ethnic armed groups has proved entirely fruitless. Though parliament passed the 2012 farmland law and amended land use policy, farmers remain victims to exploitation and vulnerable to uncertain futures. On July 26, 2012, U Tin Tun, member of Union Parliament (MP) from the Za-Lun constituency, presented a proposal to parliament urging that “the investigation into nationwide land confiscation must be launched, and there must be a problem-solving process [in place] to heal the loss of the farmers.” The proposal was approved with 395 votes in favor, 176 opposed, and 24 abstention. Though the proposal ultimately passed, the high number of votes in opposition to the proposal leads one to question the MPs’ sincerity and dedication to aiding Burma’s most vulnerable citizens. The government has formed a number of advisory bodies pertaining to land conflict, including the Land Management Committee and the Land Investigation Commission however, not one of these bodies are endowed with any decision-making powers. Instead, the Ministry of Home Affairs, dominated by the military, retains full authority to manage land confiscation cases, the majority of which are related to the military. Following the signing of a ceasefire agreement between the New Mon State Party (NMSP) and the Burmese government in 1995, the Burmese military increased their presence and scattered their battalions across Mon areas. Even in a township as small as Ye one many find nearly 20 Burmese Army battalions. According to military structure, a battalion must consist of 700 troops, resulting in more than one hundred thousand soldiers based in Ye Township. In 2000, Light Infantry Battalion (LIB) No. 586 established its base in Ye Township. Since 2000, LIB No. 586 confiscated land owned by local civilians in order to construct its military base, labeling confiscated lands as “military premises”. All of these confiscations were carried out on the verbal order of the military base wherein the military identified those lands as vacant, fallow, and virgin lands and, as such, refused to provide victims with reasons for, or information about, the confiscation. Some victims had possession of official documents, including Form No. 105 and taxpayer receipts, but they stood no chance of receiving a fair trial for the return of their lands. “Our land was confiscated in 2000. They [the military] didn’t inform us in advance; they just confiscated [the rubber plantation] and have been producing the latex [for their own profit]. They assembled some plantation owners and provided permission to work on the plantation for a year. My plantation was a new one and the rubber plants were not productive. My plantation was about 6.5 acres, but they [LIB No. 586] didn’t allow me to work on my plantation; they just expelled us from our land and started their new project of farming [Terminalia bellirica]. But the new project was a fruitless one and they abandoned the project. Again, they started farming castor oil plants (Ricinus communis). The second project also ended in failure. My plantation wasn’t used and it’s just wilderness now. There has been no compensation and no discussion regarding compensation. “According to statistics, 341.30 acres of land was confiscated by LIB No. 586 from 34 plantation owners. The land victim group positioned their land with the GPS system and the confiscated area confirmed by the system is about 348.5 acres. Even the unused land wasn’t returned to the victims. Due to abuses and oppression, it’s still difficult to collect information about land confiscation,” the victim stated. The land confiscated by LIB No. 586 is situated beside the Rangoon-Myeik Road, which will be turned into the Asia highway in the future. As such, the land beside the road is extremely valuable, with the plantation beside the road valued at up to 60 million kyat per acre. 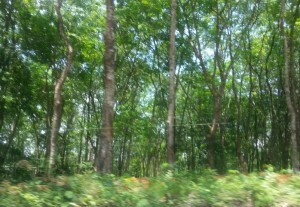 The businessmen are aware that the road will act as the business corridor of the future, and have started buying up plantations beside the road, all of which are farmed with rubber plants. In 2004, LIB No. 586 provided 12,780,000 kyat in compensation for the confiscated land, but none of that money reached the victims. The military forced the land confiscation victims to sign a document stating that they accepted the compensation of 100 kyat per acre. If a plantation owner refused to sign the document, or to accept the compensation, he or she would be refused approval to continue working the plantation and would be detained in a cell located on the military base. The victims feared they would not be allowed to work on their plantations, so they signed the documents agreeing to compensation of 100 kyat/acre. The victims were forced to provide their signatures at six places on the document; the information at the sight of each signature was covered with correction fluid, preventing the victims any knowledge of the document they were signing. LIB No 586 constructed their base, military training group and playground on confiscated lands, including lands the military had excessively confiscation which remained unused. The battalion allowed victims to continue to work these unused lands for three years, after which the victims had to work on the plantations under fifteen rules imposed by the military. If a victim couldn’t follow, or broke the rules, he or she would be fined 5,000 kyat per plant, or the permission to work on the plantation would be revoked. During the summer, plantation cleaned a 30-foot-wide circumference from bushes and small trees to prevent forest fires. If a plantation were to catch fire, the owner would have to pay the military three-times the current value of the plantation. When a rubber plant died, the owner did not have the right to chop it down, even though he was the one who had grown and harvested the plant. A permission card approved by the military was essential for farmers to continue working on their plantations. “We have been farming our plantation carefully with a lot of physical and financial investment. When the plants can produce the latex, we have to pay money [to the military] to work on our plantation. The plantation owners suffer great hardship on their livelihoods. When latex-season comes, we have to borrow money to pay the military. If we can’t pay the military, the military allows other groups to work on the plantation. We worry a great deal that the other groups will destroy our planation,” said one victim of land confiscation. Since 2013-14, under the rule of Commander Maung Maung Lwen, the extortion rate has gradually increased from 700 kyat per plant to 800, 1000, and up to 1500 per plant. Maung Maung Lwin also forced land victims to sign a fake contract in order to deceive upper-level authorities. The commander intimidated land victims and instructed them to show the fake contract to upper-level authorities when they came to investigate the situation, rather than the true contract. If victims refused to sign the fake contract they would be secretly executed. According to a former captain from LIB No. 586, low-rank soldiers did not receive any benefits from the extortion practices, as the commander, second commander and other high-ranking officials monopolize the money. The captain stated that the high-ranking officials told the soldiers the money went to the military welfare fun, but in reality, they officially recorded only 400 kyat per plant while they were really extorting 700 kyat per plant. The differences between these numbers demanded that the military officials draft two contracts, to hide the true nature of their extortion. Commander in Chief Min Aung Hline told U Phay Than at the parliament that confiscated lands located far from military bases would soon be returned and there would be no more extortion; the commander assured that compensation would be paid after some consideration. In 2014, Min Aung Hline also told the Chairman of the Myanmar Farmers’ Development Party that unused lands would be returned to the farmers. However, the promises of the Commander in Chief differ greatly from action on the ground. Have battalions rejected the orders of their Commander in Chief, or has the Commander in Chief spoken duplicitously? With current political reform taking place in Burma the military withdrew from some confiscated lands, leading victims to attempt to regain their land by sending letters of appeal to the President, Vice President, Chairman of the Parliament, Commander in Chief and the Chief Minister of the State. Despite their appeals, there have been no improvement for victims, or recognition of their land rights. Members of Parliament involved in the Commission that Prevents Damages against Civilians due to Land Confiscation conducted an investigation for a land report which will be submitted to upper-level authorities, and victims have high expectations that this report will aid their struggle for redress against unjust land confiscation. Though the military has withdrawn from some confiscated lands, LIB No. 587 continues to control the lands it has seized from civilians. The victims of land rights abuse are in need of support, and CBOs have been collecting information and organizing interviews. Beyond their advocacy, CBOs have no decision-making power regarding land conflict and, therefore, can only support the victims through articles, reports and statements documenting and raising attention to incidents of land confiscation. Once CBOs collected statements and documented information pertaining to cases of land confiscation they left the villages, whereupon victims were left to face intimidation from the military for divulging the truth. According to plantation owners, after receiving permission to work on their lands, there continue to be many challenges waiting ahead. 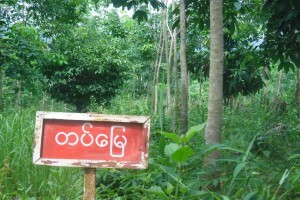 Due to the absence of the rule of law in Burma, privates and low-rank soldiers and their family members have been found to invade plantations to steal latex and latex-remnant, and to destroy materials and latex containers. Sometimes, they take the latex for their own profit. When plantation owners reported the destruction and theft to the Commander, he promised them he would put a stop to the abuses. However, these conditions did not change. Plantation owners had to pay money to work on their own plantations, receiving few benefits from their labors. After losing their lands, some plantation owners have been found to have lost the meaning in their lives, and all have encountered severe challenges since losing their lands. Among such life-changing challenges include being forced to flee to foreign countries in search of work, losing their families, being unable to support their children’s education, forced to eke out a livelihood in a state of chaos, endure severe financial constraints which have led to loss of houses and being forced to rely on relatives. While some victims settle in foreign countries to work or find a living in liberated areas controlled by the New Mon State Party, others have entered a life of crime becoming robbers and thieves. “I have six children – five male and one female; they are all school-age children. I came here and bought a plantation to support their education and to get an easy life when we get old. After the land confiscation, their father died of mental illness. I became a widow with six children and have been struggling for a livelihood ever since. The children had to stop their studies. I bought the plantation for my old life, but now it looks like I bought the plantation for the rulers,” remarks one victim of land confiscation. Generation upon generation of local farmers have been working on their plantations peacefully. Farming is their main source of income and they have their own religion, nationality, society and culture. They aren’t rich, but have loving families and food security. Their children have access to education and help the family business when their schooling is finished. They have families, affection, property and land defined by customary law. The military forced the residents to live in ignorance of their culture and tradition, while they abused and humiliated them. The military offensively attacked their livelihoods with no regard for human dignity. Burma affords no rule of law nor protection for the indigenous peoples. Although the parliament states its slogan is “People Centered” and “People’s Voice is Parliament’s Voice”, does the parliament actually hear the real voice of the people on the ground? Or does the government destroy the livelihoods of its citizens and abandon its citizens?